Swimming’s governing body has formally warned officials in Qatar and the United Arab Emirates for disrespecting Israeli swimmers at World Cup events. FINA executive director Cornel Marculescu told The Associated Press on Wednesday that the two organizing committees apologized for the “stupid” incidents in the past week. Israel’s team protested when the country’s name and flag appeared to be censored in pre-race introductions and television broadcasts, Marculescu said. The incidents raised questions about Qatar’s hosting the 2014 World Short-Course Championships in Doha. The governing body has rules prohibiting discrimination, including on grounds of religion or politics. Doha and Dubai are also scheduled to host further World Cup meetings ahead of the Dec. 3-7, 2014 worlds. Marculescu said the problem was resolved during the events, held at Dubai last Thursday and Friday, and Doha on Sunday and Monday. Israeli swimmer Amit Ivry won a medal at both meetings, though teammates noted that she seemed to be ignored by television cameras in some races. Marculescu said local organizing committees were responsible for World Cup broadcasts. “I think it was a good experience. 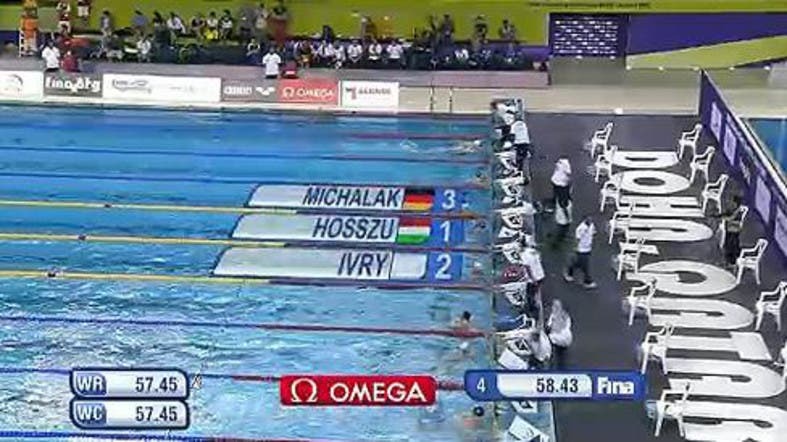 No more is it going to happen,” the FINA official said, adding that medal ceremonies involving Ivry were conducted properly. She won bronze in 100 meters breaststroke at Dubai, and took silver in 100 medley in Doha. At previous meets held in the Middle East, Israeli swimmers and officials have had difficulties getting visas to enter host countries.